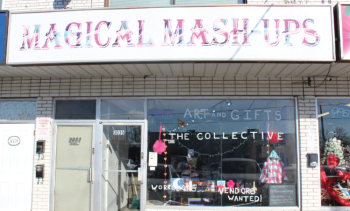 Ashley Scott, owner of Magical Mash-ups, grew up in Emery Village. She went to the local elementary school, stayed until about Grade 7, and then moved away. Life has seen her return as a working mom. And now that she has moved back, her kids are going to the same school that she attended and she’s teaching them to love the same community she grew up loving. Coming back though, she realized there were not a lot of shopping options for people in the neighbourhood. Or at least the variety she was thinking about. So she decided to do something about it, and she didn’t mess around. The artist and soap maker who had been working in Kensington Market, has opened a collective of 13 vendors, all offering a different product or service to the community. For just $30 a month, your product or service can be part of the mash-up. Currently the store has handmade soap, jewellery, home decor items, fine art, handmade clothing, antiques, candles and more. They’ve been open since the end of October and are hoping for the business, as well as their customer base, to grow. Magical Mash-ups is open seven days a week, from 10 a.m. to 7 p.m Monday to Saturday and 11 a.m. to 5 p.m. on Sunday. 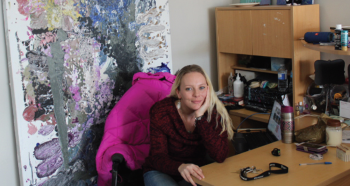 You can find Ashley and her collection of fine art at 3035 Islington Ave.